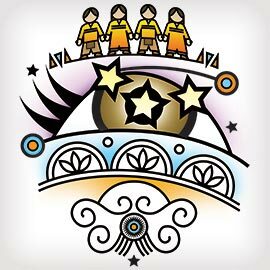 BRANTFORD – Laurier’s office of Aboriginal Initiatives will host Tehotikahrathè:tha (Their Eyes Sparkle), a Mohawk language and culture camp for children ages 10 to 12 during March Break. The camp runs from 9 a.m. to 3 p.m. March 16 – 20 at the Aboriginal Student Centre, 111 Darling Street, Brantford. Tehotikahrathè:tha is offered in partnership with Onkwawenna Kentyokhwa Kanyen’kehaka Aetewatati, a community-based organization that teaches Kanyen’keha (Mohawk language) to adults on the Six Nations Grand River Territory near Brantford. The camp is designed to help Aboriginal youth reconnect with their ancestral language, culture and songs and will provide a safe space for any and all Aboriginal youth to learn about Mohawk cultural traditions. Participants will learn how to introduce themselves and their families; sing, dance and introduce Iroquoian social songs; and practice a short version of the Thanksgiving Address, all in Mohawk. On the final day of camp, the students will showcase what they have learned and invite parents and families to join them as they run and host a social. All Aboriginal youth are welcome, and space is limited. Registration is $20 for the week, and includes healthy snacks and lunches. For more information or a registration package, please contact Bonnie Whitlow at 519.756.8228 ext. 5884 or bwhitlow@wlu.ca.